Welcome to the Department of Educational and Counselling Psychology (ECP)! The Department offers a variety of graduate, professional development, and undergraduate programs and courses. Visit Programs & Courses to explore our offerings. Read on for important application deadlines and an overview of studies at ECP. Are you planning to apply for the Fall 2019? We will be accepting applications for our Graduate Programs starting September 15, 2019. Application deadlines are firm and provided below. * All ECP graduate-level programs (MA, MEd, PhD & Post-PhD) have only Fall admission. Winter or Spring admission is not available for these programs. Looking for teaching certification? Jump to the Faculty of Education Internships and Student Affairs website Quebec Teacher Certification page. In addition to the information provided on this web site, all applicants should also visit the McGill Graduate and Postdoctoral Studies (GPS) Applying & Admissions pages for key information on admissions and funding, as well as relevant requisite standardized tests. Specifically, students are encouraged to visit the Preparing to Apply & Ready to Apply? pages for more logistical help with applying to McGill. Should you have a question about providing supporting documentation or letters of recommendation, please refer them to these pages and to GPS' FAQs. You will find general ECP admissions questions and answers on the Admissions FAQ page. Please note that the Department no longer grants deferrals, except under extraordinary circumstances. Our programs and research examine the interplay between complex human systems (cognitive, social, emotional, behavioural, and biological) to maximize: (a) learning, (b) wellness (mental and physical), and (c) human development in multiple settings and throughout the lifespan. More specifically, with both typical and atypical populations in mind, they examine issues pertaining to assessment and intervention, cognitive processes and developmental neuroscience, and the design and evaluation of learning environments and instructional practices. While ECP’s primary disciplinary bases are psychology and education, it contributes to and is enriched by extended interdisciplinary collaborations with, among others, medicine and other health professions, neurosciences, computer science, science, social work and policy, and law. Students in our programs benefit from having access to the McGill Psychoeducational and Counselling Clinic and the Departmental Assessment Materials Resource Centre. To develop their professional skills in assessment, therapy, and supervision, ECP students are equipped with the latest standardized materials and a state-of-the-art venue within which to conduct psychological and cognitive assessments. Our professional programs also have established connections with world-class public and private organizations, which include health care facilities and school boards where students receive supervised training for internships and practica. After graduation, our graduates secure careers in a varied and rewarding range of settings. These include, but are not limited to, academic and research settings, professional psychology (counselling and school psychology), specialized and innovative teaching, educational research, development and leadership at all levels (e.g., schools, colleges and universities, school boards, ministries of education), staff development, and education in the professions. Our faculty members are involved in intra- and interdisciplinary collaborative research locally, nationally, and internationally. These networks offer students valuable exposure to, and connection with, different research laboratories, research leaders, and professional organizations. Students benefit from international mobility programs and specialized training offered in specific locations. Visit the Research page for a collection of links to ECP research activities, faculty publications, and full-text ECP theses. Working closely with faculty members in their research teams, our students enrolled in research-based MA and PhD programs have proven very successful in obtaining major external fellowships from bodies such as SSHRC, FQRSC, FRSQ, and CIHR. Visit our Financial Aid, Fellowships & Funding page for funding information. Many ECP students take advantage of a range of employment opportunities while enrolled in our programs, including research assistancships (RAships), teaching assistanceships (TAships), instruction, and McGill Work Study. Visit our Working page for more information about various opportunities for students. For fee information, visit the McGill Student Accounts' Graduate Tuition & Fees page. The programs offered by ECP all fall under McGill's standard rates. The only divergence is amongst certain cohorts of students in the Counselling Psychology and School/Applied Child Psychology programs due to the nature of the program and the utilization of the ECP Assessment Materials Resource Centre. As much as your education is an investment in your future, there is still the reality that the cost of attendance at university must be taken into account when making such life decisions. For a breakdown of the costs to attend McGill, the McGill Scholarships & Student Aid's Cost of Attendance page allows you to drill down to your specific fees based on your degree, program, and citizenship. Registering for 1 or 2 courses? Not in an ECP degree program but interested in registering for an ECP course? A number of ECP's courses are available to non-program students with permission from the Department. Visit our Special Student course registration information page for information and procedures. 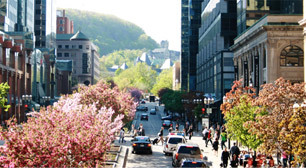 Montreal is an ideal place to live while pursuing graduate studies. It’s an affordable, safe, multi-cultural, cosmopolitan city located east of Toronto, and north of New York City. Have you been selected as a referee for a prospective student to an ECP program? Please visit our Referees page for forms, instructions, and tips.